Plant photosynthesis was stable for hundreds of years before the industrial revolution, but grew rapidly in the 20th century, according to new research published today in Nature. Photosynthesis is the process through which plants use sunlight to convert carbon dioxide (CO2) into carbohydrates to fuel their growth and other activities. Yet, researchers lack a clear picture of global trends in photosynthesis over the past few centuries. Some human activities might have stimulated plant growth, while others might have hampered photosynthesis. Conflicting results from different experiments have stoked scientific debate for years. But maybe not for long. Campbell and an interdisciplinary, international team of scientists discovered a chemical record of global photosynthesis spanning hundreds of years. The researchers estimate that the sum of all plant photosynthesis on Earth grew by 30 percent over the 200-year record they captured. The research did not identify the cause of the increased photosynthesis, but computer models have shown several processes that could, together, create such a large change in global plant growth. The leading candidates are rising atmospheric CO2 levels, a result of emissions from human activities; longer growing seasons, a result of climate change caused by CO2 emissions; and nitrogen pollution, another result of fossil fuel combustion and agriculture. The human activities that underlie the growth in photosynthesis have both positive and negative consequences. Another effect of the rise in photosynthesis is that it can cause plants to remove CO2 from the air and store it in ecosystems. Unfortunately, CO2 emissions from fossil fuel burning overwhelm any uptake by plants. The researchers discovered the record of global photosynthesis by analyzing Antarctic snow data captured by the National Oceanic and Atmospheric Administration (NOAA). Gases trapped in different layers of Antarctic snow allow scientists to study global atmospheres of the past. 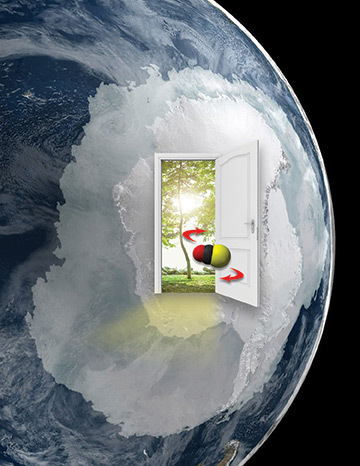 The key was finding a gas stored in the ice that provides a record of the Earth's plant growth. Previous studies have found that carbonyl sulfide (COS) serves this function. COS is a cousin of CO2, and plants remove COS from the air through a process that is related to the way they uptake CO2. While photosynthesis is closely related to the atmospheric COS level, other processes in oceans, ecosystems and industry can change COS level also. To account for all these processes, Campbell coordinated analysis between members of the research team, including Ulli Seibt from UCLA; Steven J. Smith of the Pacific Northwest National Laboratory; Steve Montzka of NOAA; Thomas Launois of Institut National de la Recherche Agronomique; Sauveur Belviso of Laboratoire des Sciences du Climat et de l’Environnement; Laurent Bopp of Laboratoire de Météorologie Dynamique; and Marko Laine of the Finnish Meteorological Institute. Their work was funded by the U.S. Department of Energy, NOAA, the Academy of Finland, H2020 and the European Research Council. Future research, the researchers said, will include studying current changes in photosynthesis using the ongoing COS measurements made by NOAA.